As I sat on my flight to California, legs cramping in the tiny airline seat I was crammed into I became antsy wanting the flight to end and the fun to begin at the Workshop and Luau. Staring at the in-flight monitor ahead of me the minutes seemed like hours and hours seemed like days as the planes position crept across the screen. It was like watching water boil as I started freaking out because we weren't going fast enough … well at least that's how it seemed. Treola's Workshop & Luau highlights were capped off by Robert Seale's Lighting Breakout Session. "There is nothing better than a hands-on how to class," Treola said. To kill some time I reached down for my computer, both batteries charged, and inside one pouch a DVD. Running late at home I asked my niece Amanda to throw a movie in my bag for me, I never did see what she put in there so reaching down what do I pull out? SHREK! YES SHREK! I wondered what she was trying to say. Did I remind her of a " Big, Ugly, Scary Ogre? Relaxed I watch my movie but still had that Ogre thing in the back of my head. Arriving at LAX with legs numb from that dam seat I didn't care because I was safely on the ground. Now there must be something about me that attracts interesting people. I call them "interesting" though some of you might call them CRAZY. Sam, the cabbie I hailed, played his harmonica the entire ride to the hotel. The music was great the problem however was he only used his hands twice the entire ride. The only times his hands hit the wheel was to make the turns to get me to my destination. Sam drove with his knees and didn't care much about driving alongside the police officer that just shrugged his shoulders and drove off as he watched Sam wail on his instrument. Seeing stuff like this happens all the time in New York but I wasn't really ready for this in LA. I asked him…." You from New York?" but he never stopped playing until he asked for his money. "$14.00 dollars" he said, his only words to me. Standing outside of the Manhattan Beach Marriott I did a double take wondering if I was at the right place. Having attended other workshops on the past this place was awesome and above any facility I'd been to. The beautiful lobby, conference rooms, bar, restaurant, and rooms created an electricity in the air along with the steady stream of Hawaiian shirts around me I knew it was going to be a great luau. Once settled it was time to find where everyone was. I must admit I expected to see a great big party in the "Presidential Suite" with photographers sitting, laughing and drinking. Boy was I mistaken! It was more like a mad scramble as a bevy of activity to make the last preparations for The Luau were being made. Let me walk you around the room. Bob Deutsch is sitting along side of Vincent Laforet working on a table overflowing with gear. Bob was helping Vince with his presentation by timing each slide so it lands perfectly with the music. Working for perfection went well into the night. As Bob and Vince did their thing Ronal Taniwaki paced from room to room with his fishing boxes of audio and video adapters, slide projectors and extension cords making sure each breakout had what they needed come morning. On top of Ronal's duties he made sure his suite was properly supplied and even going as far as to donate that Hawaiian shirt to a unnamed pro (who'll go nameless) who's supposed Hawaiian shirt looked like something from the 60's. The bedroom housed Brad Mangin who quietly worked at creating the slot A story for the SportsShooter.com home page. Brad edited up 40 something behind the scene photos that went live on the site early in the morning. Scott Sommerdorf cruised the rooms as he documented the scene behind the scene with his camera. The outdoor terrace became the smoking lounge; the bathroom tub filled with ice became the refrigerator. On top of this was a steady flow of accomplished photographers like Peter Read Miller, Trent Nelson, Mark Terrill, Rick Rickman, Deanne Fitzmaurice, SportsShooter.com's coding wizards Grover Sanschagrin and Jason Burfield among a list of other's I'm sure I missed. Like I said there was allot going on. Treola was one of the people who was in charge of carrying Bert in on a surfboard - without dropping him, being the main objective. Turning in exhausted from my long flight and time change that put me on a 20-hour day I crashed. The following morning I was still dead tired but excited and ready to go. As I moseyed on down to the main ballroom I find Bert resting on a surfboard he was going to carry down the isle to start the luau. Thinking it would have been cool to have Bert sit on the board and carry him in was a great idea until we tried to figure out how to get Bert off the board without killing him. We didn't tell Bert about our concerns but instead kept quiet and decided to go with the flow! Had an accident happened would have been a bad thing but least there would have been a thousand different angles of the board breaking and our Big Kahuna crashing to the floor. The luau was an awe-inspiring event to say the least. 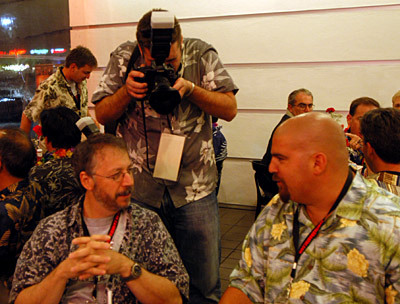 My highlights include Vincent Laforet's opening presentation that set a standard for the luau. Vincent's display of humanity along with a photographic excellence beyond words made me jealous that his art comes so naturally to him. The very adorable Deanne Fitzmaurice's determination and perseverance allowed her an opportunity to document Barry Bonds as he was on track to break the all time home run record. I had an overwhelming appreciation for the time and effort Deanne had put into that story to even be in a position to shoot her first pictures. She taught me that establishing a level of trust opens doors to many levels of photography. Ben Van Hook left my head spinning what a show! V.J. Lovero's story as he battles illness brought me to tears. V.J. 's a wonderful person and accomplished photographer and it's easy seeing that in his work that speaks louder then words. What's ever more inspiring is the unconditional support of his team and fiends as he goes through another trial in life. We all wish V.J. the best. Capping off my Luau highlights was Robert Seale's lighting breakout. There is nothing better then a hands-on how to class. To see how Mr. Seale worked and how I might be able to apply his art to my photography was worth every penny spent coming to the luau. Thank You Bert, faculty and volunteers for this opportunity and for making the luau a highlight of my year.